How can I generate a Support PIN? (mt) Media Temple takes security very seriously. When contacting (mt) for support over the phone, you must provide a Support PIN or your AccountCenter password to authenticate. This guide will provide instructions for generating a Support PIN. 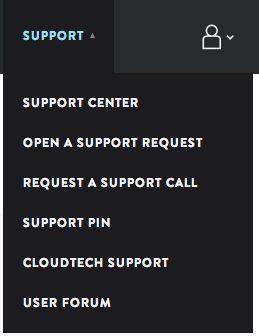 Click on the Support tab, and then select SUPPORT PIN. Now, simply click on Generate PIN. Once generated, you will see a new 4 digit number that you provide to any (mt) Media Temple representative. Q: Am I required to use a Support PIN every time I call (mt) Media Temple for support? A: No, at this time, you are not required to provide a Support PIN when calling us. 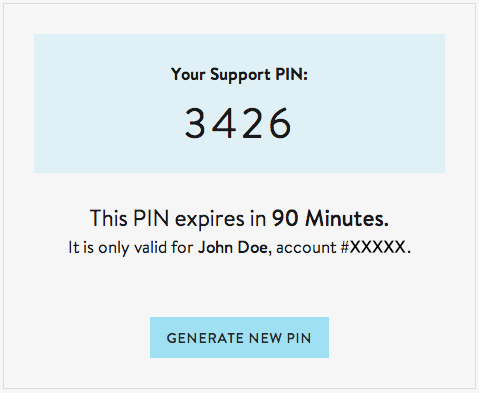 However, we do strongly recommend using the Support PIN instead of providing your AccountCenter password. This will keep your AccountCenter password more secure and allow you a more convenient way to get support. Can I continue to use the same Support PIN? A: No. 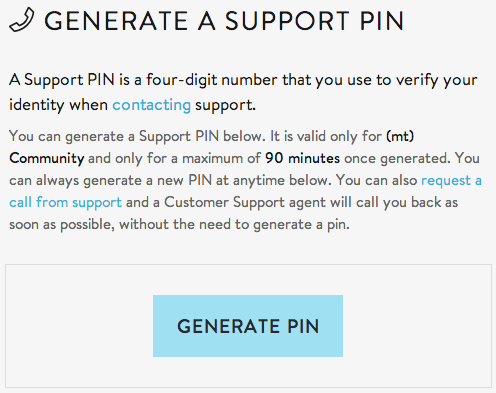 The Support PIN is only valid for one use or until it expires. Once a PIN has been used it will no longer be valid and you may be required to generate a new one. This PIN is only valid for the contact logged into the AccountCenter when the PIN is generated.